While the Pandavas were in exile, one day, the sun god gave Yudhisthira the bowl of plenty (akshaypatra) and said , "Give this to Draupadi. Once a day, she can take out as much food as she wants until she herself has eaten. Till then, this bowl will not run empty." One day, Sage Durvasa and his disciples were passing through the forest. They came to the hut and asked Draupadi for some food. 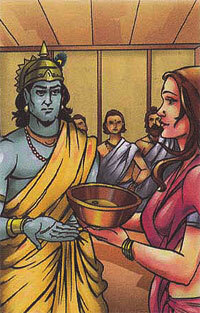 Draupadi had already eaten and she knew that the bowl wouldn't yield any more food. Draupadi did not want to turn away the holy sages without food and prayed to Krishna, who came and said, "Give me some food." Draupadi said, "This is no time for jokes, please help me feed the guests." Krishna said, "That is why I ask for food." One grain of rice was left in the bowl, Which she gave to Krishna. Krishna was satisfied, and surprisingly the guests too were satisfied. They left without asking for food.